When Apple introduced the iPad Pro, I was intrigued by the technology, and I could clearly see opportunity for the device in the supply chain. Unfortunately, a handful of limitations remain that will hold adoption back and keep organizations with tried and true PCs instead. Enterprises cannot get rid of the PC easily even if they want to. The reality is that many enterprise applications, especially browser-based apps, are coded to work on Internet Explorer. At least right now, there is no browser that can replace IE to let these apps run on the iPad Pro. One application, called Parallels, can run Windows on iPads. However, this type of application uses Remote Desktop Protocol (RDP) connection. In real terms, that means that users experience annoying latency. In addition, they must still have a Windows-based PC to establish a remote connection and run the applications on the PC. Enterprises are not like consumers. Organizations have invested heavily in both infrastructure and the personnel to support that technology and supporting/compatible technologies and infrastructure. It’s hard to replace those deeply embedded technologies. Imagine trying to rip and replace a Warehouse Management System running 17 distribution centers and doing $7 billion plus in sales every year. Any decent sized change is likely to give the ruling vice president of the organization a heart attack. Change in the enterprise is hard because any change needs to be supported by clear and solid return on investment (ROI). Further, the organization needs to work through the change management process, which slows everything down. Having said this, of course, people are changing and enterprises are changing. Change is the only constant in life. 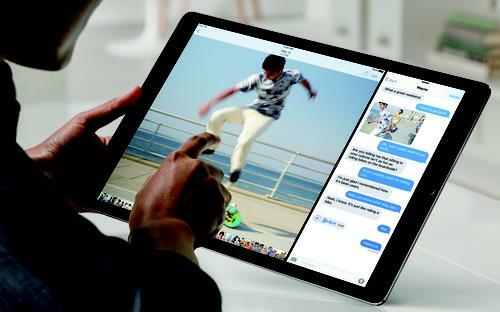 Eventually, the iPad Pro may get rid of the PC, but it is not going to happen overnight or even in the short term. Someone needs to come up with a browser that runs on iOS as well as every other OS, and that can do everything that IE does, including application support and backwards compatibility. That person will become rich. Let me be clear, I have great respect for the iPad and its creators. Even my own mother, living in a third tier city in South India, is asking for one because she understands the ease of use and usefulness of it. My goal with these ruminations is to invite healthy discussion. I want to offer useful critique rather than harsh criticism. Hopefully, it will be one step in nurturing a product innovation ecosystem that supports creators. Creating is a hard job—and the support is well deserved. Let me know your thoughts in the comments section below. How do you see the iPad Pro helping supply chain practitioners? Do you see it as a tool that would make your job easier?